We woke to a tranquil world. Mallards slipped and slid over the solid ice sheet covering the canal and surrounding Orient. The rest day I craved had become an unavoidable necessity. Despite a forecast temperature spike over the next few days, melting ice up to two inches thick would take a while. So we relaxed into the day, sat in front of a Squirrel filled with glowing coals and talked about a new dog. Bassets aren’t happy solo boaters. Since twelve-year-old Tasha failed to wake on a dreary morning at Tattenhall marina three weeks earlier, our remaining basset, Abbie, has been far more depressed than usual. Cynthia has rescued a string of bassets. They’re amiable comedians, non-confrontational, affectionate and loyal. They also shed so much fur that owners need to follow behind them with a small truck. The breed is also prone to simultaneous drooling and head shaking which sometimes result in walls which wouldn’t look out of place on an alien film set. They’re big dogs, far too big and heavy for Cynthia to lift easily, or even at all, over a narrowboat gunnel on and off the boat. Great dogs, but not particularly narrowboat friendly. Cynthia had a few suggestions, but I had ideas of my own. I haven’t owned a pet since I managed a Chef & Brewer pub on a rough Milton Keynes estate in the mid-eighties. I had two then. A ten stone rottweiler, Conan – named after Arnold Schwarzenegger in Conan the Barbarian, and an eight-foot-long Burmese python inexplicably named Arthur. I liked impressive and memorable pets. Cynthia is a dutiful and perceptive wife. After many hours of careful thought and online research, she found what she thought was the perfect dog, one which would suit both my character and my needs. The breed wasn’t quite what I had in mind, but the idea grew on me as we discovered more about them. Exhausted by a morning doing very little, we swapped a glowing boat stove for the blazing logs of a country pub fireplace. The Boat in Catherine-de-Barnes offered the perfect remedy for an insatiable appetite generated by two weeks of dawn till dusk cruising. I snuffled my way through a mixed grill the size of an English village, found room for a sugar-laden dessert and staggered back to Orient for an afternoon of inactivity. The Grand Union canal looked promising on Monday morning. Water rather than ice surrounded the boat. Water that hid a nasty surprise. A shallow layer of meltwater covered the ice beneath. After my pre-cruise checks and with the engine straining at the mooring lines eager to tackle a new day’s cruising, I thawed the cabin roof ice with a couple of kettles of boiling water. The first time I climbed down the frozen rungs of a lock escape ladder and stepped onto a roof more slippery than a used car salesman was also the last. These days I always make sure that the cabin top is safe to walk on before the day’s cruise begins. Once the roof was safe for rubber-clad feet, I walked its length smashing the ice which still held Orient firmly on its mooring. I hoped that any frozen patches along our route would quickly disappear as the thermometer raced towards the forecast high of ten degrees. They didn’t. Forcing a path through ice is hard. Hard on the boat, harder on the paint covering it and hardest of all on the boat owner and his bank balance. Losing expensively applied hull paint is inevitable. Shards of ice flay the waterline steel. Even thin ice can reveal bright steel after an hour or two. Scraping blacking off canalside boats can be lead to even more heartache. Moored boaters hear a distant hiss and crackle. They know a boat is coming. They open side hatches and windows, pop heads out of engine bays while they pretend to carry out routine maintenance. They’re really waiting and watching, noting the cracks which radiate from the bow of the oncoming boat. They look for broken sheets with ragged edges, forced at speed into their own waterline. God help any ice breaker who moves past a line of moored boats at anything faster than the slowest crawl. That presents the helmsman of the moving boat with a dilemma. He needs to power through patches of thick ice. Thick ice often thins, so the crawling boat surges forward, forcing jagged chunks at all and sundry. Too little power and the moving boat shudders to a halt, close enough to the boats they pass to be offered candid opinions on the wisdom of cruising on frozen canals at all. My problem wasn’t so much with the boats I passed, there were precious few, but with the direction in which the cracking ice forced us to move. As the ice thickens the boat slows and the more likely the bow is to follow the path of the ice cracks. On several occasions that direction was towards the offside shallows. Reversing our course was usually an exhausting and frustrating affair. The bow would be firmly glued to a mud flat by then and the stern resting in loose silt. 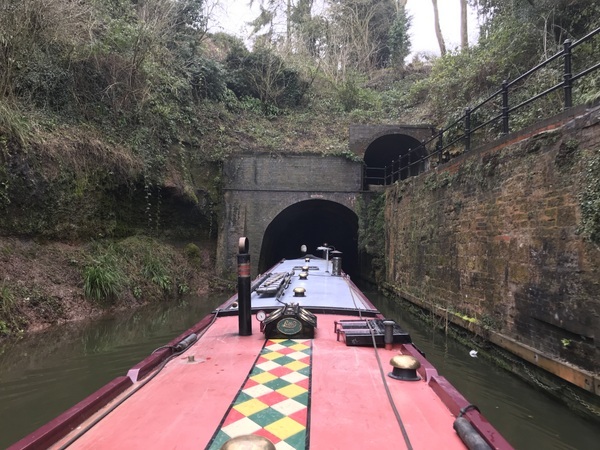 Without the aid of passing boats or towpath users, the only way to escape the canal’s offside embrace was to pole the stern into the centre channel. Once there, the propeller would hopefully have enough water to provide some meaningful reverse thrust and help drag the boat free. ur first grounding took twenty minutes to escape. The second lasted three-quarters of an hour. Sweat trickled down my back despite the shaded cuttings’ icy chill and shedding most of my insulating layers. I saw stars and an end to our cruising day. I knew the next grounding would be our last. I didn’t have the energy to press. After four hours of back-breaking work I had to admit defeat. Our short cruising day ended at Knowle’s flight of five locks. I needed water. There was a tap at both the top and the bottom of the flight. A friendly volunteer lock keeper offered to help me through the flight so i ignored the first tap. The five locks took half an hour. Forcing my way through thick ice to the water point below the flight took just as long. Discovering that it had been turned off was a bitter disappointment, especially when the lock keeper told me the tap above the flight was running freely. The canal ahead of us was frozen and the water point unusable. We tempted fate and the possible wrath of other water seeking boaters by staying the rest of the day and night on the water point. No one bothered us. We enjoyed a peaceful and trouble-free night before the next day’s assault on the twenty-one lock Hatton flight. We reached Hatton lock 26 on the twelfth day of our cruise south from Tattenhall marina. Over the twelve days, we passed just ten moving boats. I dropped down the first lock and then moored on the lock landing before the second, outside the excellent Canal and River Trust managed Hatton Locks Cafe. After seeing an average of less than one cruising boat a day, what were the chances of one wanting to use the lock landing while Cynthia and I stopped long enough for a bite to eat? Sod’s Law and all that. Just as I finished tying my stern line, a CRT volunteer appeared out of nowhere to ask me to move. He was behind us in a maintenance tug. After a little negotiation, I set the lock ahead of me for the tug, they sailed past and Orient stayed where she was. We walked into the cafe to see if the sign behind the counter lived up to its promise. “We don’t serve fast food. We serve home cooked food as fast as we can.” It’s good news for passing boaters. Their food is wonderful. 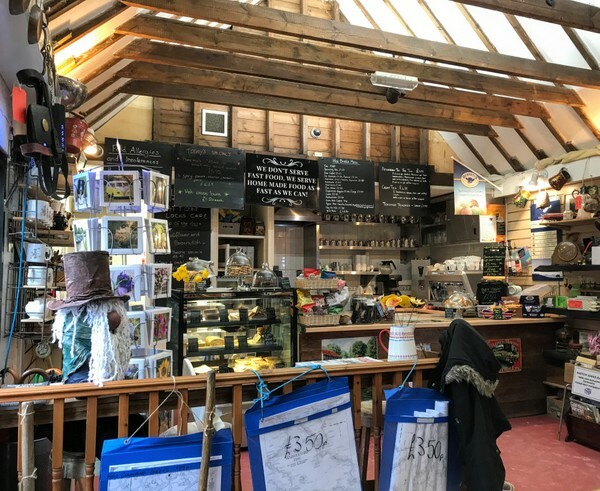 Hatton locks cafe – An oasis for the weary boater. Despite the energy boost from a delicious slab of homemade cottage pie, I could only manage a dozen locks before darkness defeated me. It wasn’t a problem. 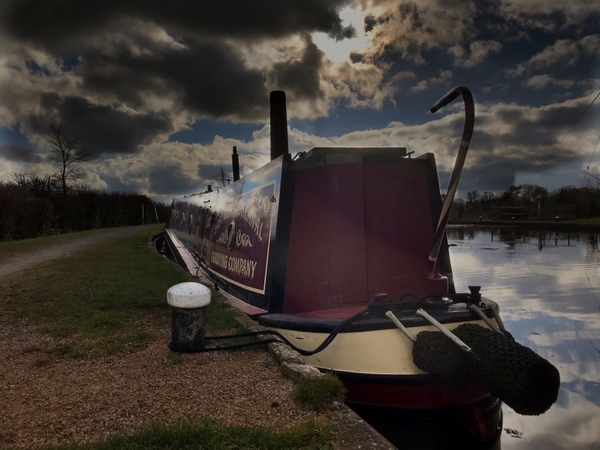 There are plenty of mooring opportunities on the Hatton flight, and no one is fighting for them on cold February days. I grounded again the following day. 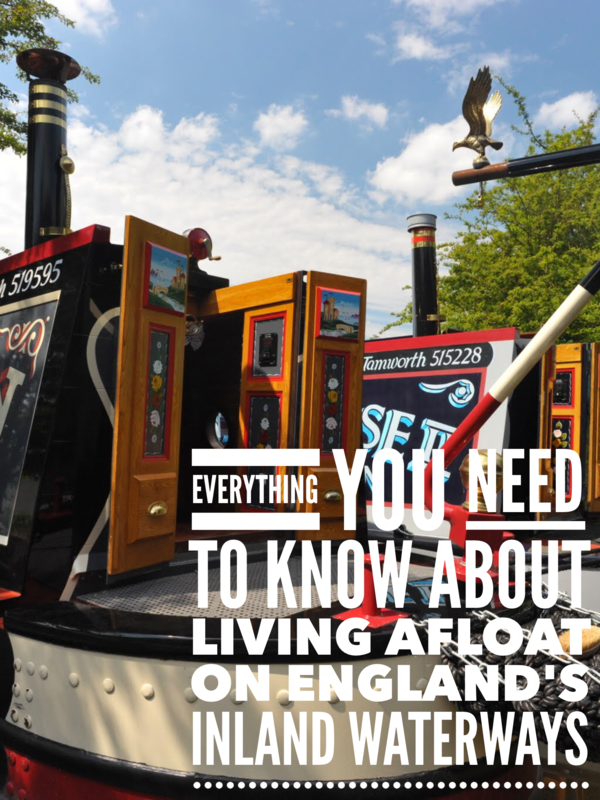 We flew down the remains of the Hatton flight, dropped down through the two Cape locks and the spotted a possible mooring in central Leamington Spa close to a retail park offering food cupboard salvation. A seductive row of sturdy bollards lured me onto a shallow mud flat. Despite my best efforts I couldn’t reverse off or move the boat an inch with a pole. After sweating for half an hour, I tied my two centre lines together, fixed the long rope to a stern deck dolly and tossed it to a pair of passing runners. The army types, all brawn and can-do attitude, huffed and puffed and did their level best to slip right out of their teeny tiny shorts. Their manly grunting worked wonders, especially for Cynthia who watched slack-jawed from the galley porthole. Orient’s stern slid into the centre channel and then onto a mooring next to Liddl where I should have stopped in the first place. We shopped and then cruised some more, mooring at dusk on another landing, this time on a remote lock on the Fosse flight. It was our last scheduled night out on the cut. A gentle cruise and nineteen undemanding locks the following day brought us home. How to Calcutt Boats, the beautiful location where I have moored and lived for most of the last decade. Orient has done us proud. The Eighty-three-year-old Lister engine has performed tirelessly for one hundred and twenty-five hours since our first attempt to cruise south on Sunday 29th December. The freshly blacked hull has bashed and scraped its way through one hundred and eighty-eight locks and many miles of frozen canal. The engine and hull have passed the test with flying colours, although much of the lower part of the boat looks like it’s been on the wrong side of an argument with Mike Tyson. Orient has done us proud, but she still needs a lot of tender loving care. The Kabola boiler often fails to stay alight, nor does it provide heat to the bathroom, bedroom or engine room radiators. We hope a replacement pot will cure the problem. Time will tell. The washing machine has sprung a leak. We hope it’s a simple fix. Determining the cause will involve extracting the packing which has been jammed in place to stop the appliance from shaking when it spins. Until that issue is resolved, we will have to use the marina facilities. The generator had what may have been a terminal fit on our cruise south. We need a diagnosis from an engine doctor sometime soon. Fortunately, we still have our trusty Honda suitcase generator for emergency situations, like the one we have now. Our new mooring is in the little-used north-west corner of Calcutt Boats’ Locks marina. I laid a one hundred metre power cable to the mooring three years ago. The cable was buried under tonnes of clay to protect it. The protection didn’t work. Someone, possibly equipped with a very sharp gardening tool, appears to have nicked the cable. It will need replacing before Orient can have shore power. Apart from these teething problems, our new home is pretty much perfect. All we have to do now is finish paying for her. A task which will be made much less painful if we sell our Dutch cruiser which is currently moored in South Holland. At least I will have a delightful distraction after a hard day’s work. We hired a car and drove to Whitby yesterday. Enterprise Car Hire is exceptionally boater friendly. They picked us up at the marina and drove us ten miles to their Daventry branch to collect a Hyundai i10. The comfortable little car cost us £37 for the weekend, roughly half the cost of the fuel for the seven-hour drive. Our trip north was to collect the new dog Cynthia has spent weeks looking for. Remember the criteria? Rough, tough, muscles like a bodybuilder on steroids and with a name to make an Italian hit man proud? Here’s our new mutt. Meet Orients guard dog – Intruders beware! 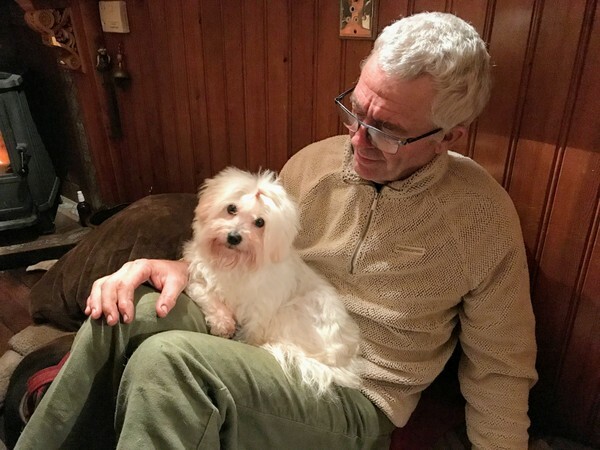 She’s a Coton de Tulear, a pocket pup popular with Madagascan royalty. She’s neither rough nor tough but has many redeeming features. She doesn’t shed so there’s no wading knee deep through discarded fur. She’s also surprisingly quiet for a little dog. We’ve had her on the boat for twenty-four hours now. Apart from a low growl when I walked into the boat this morning, she hasn’t uttered a sound. Although she’s in a completely alien environment, she’s already made herself at home. She walks to heel and responds to her new name. She came to us with the name Lady. We prefer Sadie. She doesn’t seem to mind what she’s called, as long as calling her involves a little affection. Sadie is the perfect boat dog as far as I’m concerned. Maybe I’ll look as though I’m more comfortable with a handbag than a hand grenade, but looks aren’t as important as having a gentle companion, one who is reputedly an expert at rat catching. Visitors, you have been warned.